If you’re a child or even a parent of the 1980s, you remember the Nintendo zapper gun. The futuristic toy pistol came with every new game console along with the game Duck Hunt. It was an engineering marvel of its time that mystified anyone who tried it. 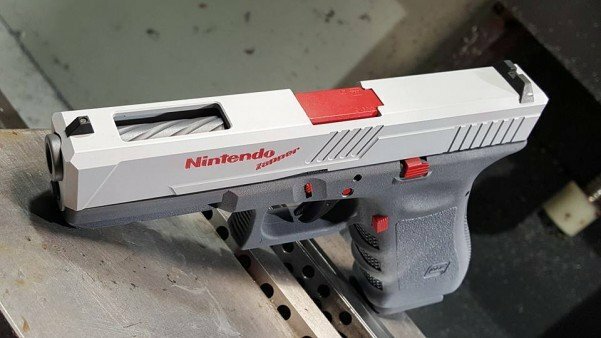 In recent weeks, two gun makers have created actual pistols that look remarkably like the Nintendo gun. But before you get too excited about the ethical concerns of making a toy into a real weapon, know that both creators have explicitly said it is one-of-a-kind. In the case of Precision Syndicate, whose pictures of its Nintendo glock on its Facebook page went viral over the weekend, the company received thousands of comments and emails with concerns causing it to release further details shortly after. A few weeks previously Black Sheep Arms showcased a similar Nintendo pistol, this one looking a little bit more like the actual zapper. Along with it they posted a video of the gun in action and a side-by-side of the gun with the actual zapper. Luckily we can all rest assured this is not something expected to hit the market.